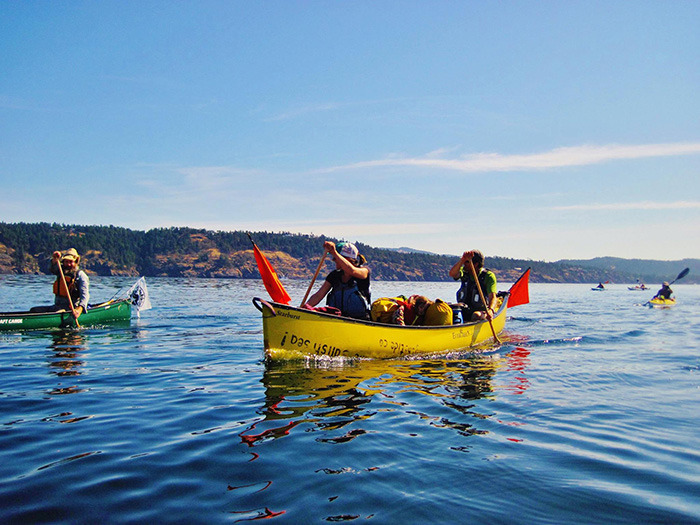 Participants in the annual Turning the TIde event, a five-day, 70-kilometre journey through the southern Gulf Islands as part of a peaceful protest of tanker traffic and the expansion of industrial development in the Salish Sea. Wading into the waters of the Salish Sea at Dolphin Dock at Swartz Bay was an emotional experience for Emily Rogers. Usually, Rogers, along with hundreds of other Victoria residents, will take the B.C. Ferries to travel from one island to the next. However, at 6:30 a.m. on a Friday morning three years ago, Rogers, along with roughly 80 other people, quietly glided their canoes, kayaks and sailboats into the waters next to the ferries to embark on a journey of the southern Gulf Islands to raise awareness of the Salish Sea and the importance of protecting the ecosystem. She felt dwarfed sitting in her kayak next to the giant ferry, but quickly began to form an emotional and personal connection with the water she was bobbing in, in a way she’s never experienced before. “It really changed the experience. Being down on the water that close and being able to touch the water and see the sea life underneath me gave me a newfound appreciation for the diversity of the ocean and how dynamic of an entity it is,” said Rogers. The five-day paddle, known as Turning the Tide, started three years ago and is a peaceful protest of tanker traffic and the expansion of industrial development in the Salish Sea. During the roughly 70-kilometre journey, which included exploring and camping at Pender, Mayne and Salt Spring islands, Rogers spent hours on coastal waters and encountered wildlife such as birds, otters, seals and other sea creatures. She gained an appreciation for the waters that many coastal communities rely on. “It envelopes all your senses. Your hands are wet and somewhat sore from the salt that they’re bathing in. But you can reach down and feel the coolness of the ocean, you can look down and see the depth of the sea life. You can see the huge abundance and variety in the ecosystem that you wouldn’t otherwise be able to,” Rogers said of her first Turning the Tide experience. This year’s paddle begins on Friday (today) and goes until Tuesday, July 26, beginning and ending at Dolphin Dock. Victoria city councillor Ben Isitt has participated in the paddle with his family for the past three years and said the event helps build community on the water. “We see a lot of threats to the Salish Sea and to the coast particularly relating to pipelines and tankers and the extraction of fossil fuels and even broader climate change impacts. 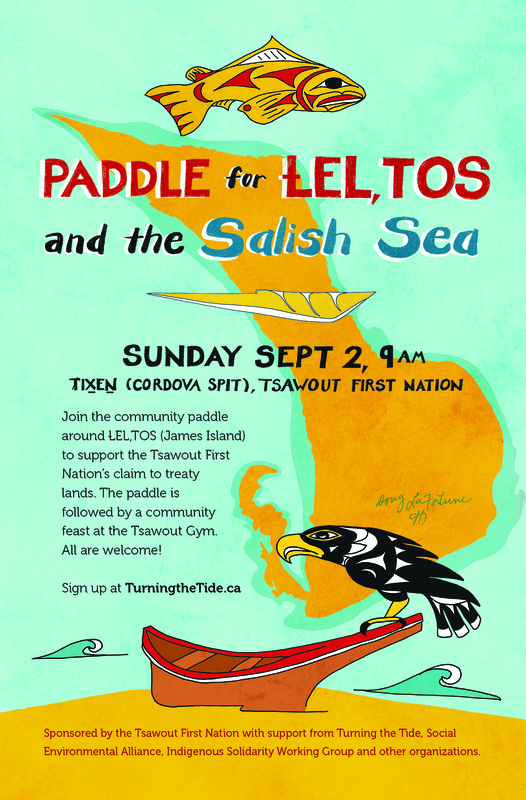 For the communities that depend on the Salish Sea and for the marine ecosystem, it’s important to demonstrate our love for the coast and our commitment to protect it and that’s what Turning the Tide is all about,” said Isitt, who will be travelling in a canoe. For more information visit turningthetide.ca. Enter your email address to follow Turning the Tide and receive notifications of new posts by email.